Aspen Exterior understands that picking the right siding for your home is a delicate balancing act between good looks, durability, maintenance and affordability. We carry many different types of siding materials that include vinyl, fiber cement, composites, as well as cedar and stone. Our sidings have different textures, sizes and colors which are all low maintenance. Vinyl siding is the most widely used material today. Vinyl siding comes in different sizes from 3”, 4”, 5”, 6”, 7” and comes in beveled, dutchlap or board and batten vertical panels. On display we have CertainTeed, Norandex, Royal, Mastic & Alside sidings. Vinyl sidings now have fade protection such as CertainTeed’s Perma Color Lifetime Fade Protection that infuses UV inhibitors to allow for darker color shades. Vinyl sidings are also available with insulation backers to save energy and give support to the panels such as Mastic’s Structure Siding. Cedar siding is cut most commonly from western red cedar. It offers great structural stability, which allows it to retain its shape, have nails driven through them, and allow various types of wood stain applications. Cedar siding keeps your home warm during the winter and cool during the summer; it’s also a good environmental choice. Fiber cement siding is a strong mix of wood pulp and cement. It’s the only type of siding that combines the performance of masonry with minimal upkeep. It’s rot, fire and termite proof—unaffected by the wind and cold—with the look of painted wood clapboards, shingles; even stone and brick. It’s the new kid on the block in terms of siding. Architects like to use it because it holds down costs without compromising the look and design of the home. 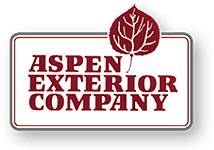 Aspen Exterior looks at siding accessories like the finishing touch of a well-dressed person. Accessories enhance and complete your home’s design, along with providing extra durability of any type of siding you choose. Decorative accents capture the look of the home. From shutters to columns, we have what you need to provide those finishing touches to the outside of your home.